All Yamin and Yamin/Carlson songs published by Yamin Music BMI. All Christopher songs by Clarinet Road Publishing BMI. 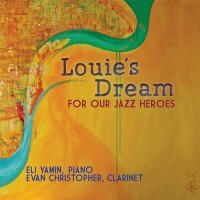 Thanks to all our jazz heroes past and present. Also thanks to Rhea Gill of Arts are Basic in Nebraska for asking us to put together a program of our heroes and to Judi Holifield and the Mississippi Arts Commission for presenting the duo several times and supporting its growth. Thank-you to Adrianna Fabrega for the use of her magnificent painting for the cover. The painting was originally inspired by Rwandan Child, a composition by Eli Yamin. It perfectly represents Louie’s Dream, and the idea that paying attention to the wisdom of children helps us know and support the unity of all humanity. The Jazz Drama Program is a New York based 501c3 non-profit organization that uplifts teachers, students and their communities with interactive experiences in the jazz arts-storytelling, music, theatre, dance and visual arts.